Pizza night comes often, and we created this one with various items from around the kitchen, and fresh greens from our garden! We have heard about grinding the wheat berries for making the dough, but we don’t have a food mill yet so we buy our dough pre-made. Preheat the oven to a blazing 475 degrees. Once the dough is stretched to size, we add some Chipotle Peppers in Adobo Sauce – finely dice one of the peppers and add a bit of the sauce. This has a great smoky flavor, not too hot, and you can get it in the mexican section of the grocer. Next put a thin layer of grated white cheese. 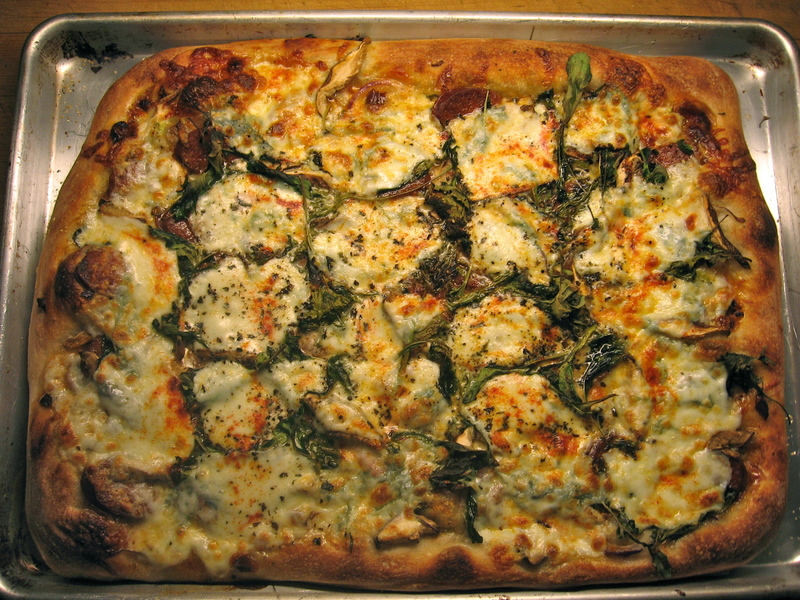 This will melt and help the toppings adhere to the crust. 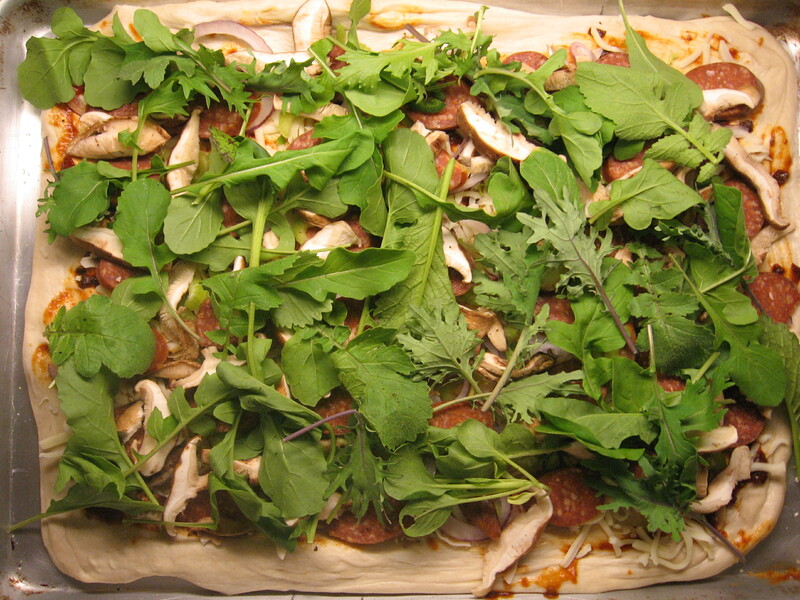 Then add a layer each of sliced pepperoni (we like uncured, but any kind will do), a handful of diced celery and some thinly sliced red onion, some mushrooms (we love shitake), and tonight we added a layer of arugula and bitter greens. 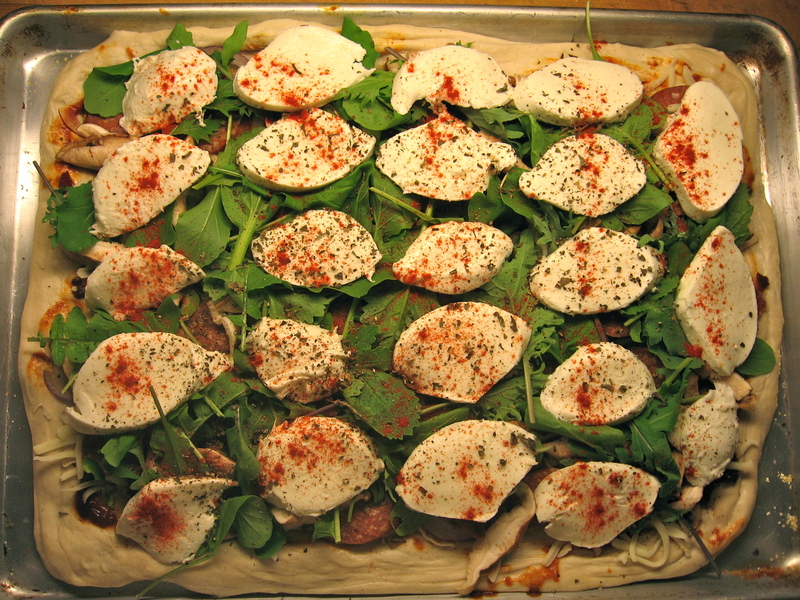 Then top it with some fresh mozzarella, a bit of dried basil and some smoked paprika. Maybe a crack or two of black pepper. Pop it into the oven for about 15 minutes, then rotate the pizza, then let it go til golden brown, about another 10 minutes. That looks scrumptious. I have some chipolte peppers and wasn’t sure what to do with them. Now I have an idea! Thanks.